Canadian Prime Minister Justin Trudeau’s trip to India may have had more than its share of controversies but that hasn't harmed his exuberance. On Saturday, he wooed the youth by speaking at the United Nations Youth Changemakers Conclave (UNYCC) 2018 in New Delhi. 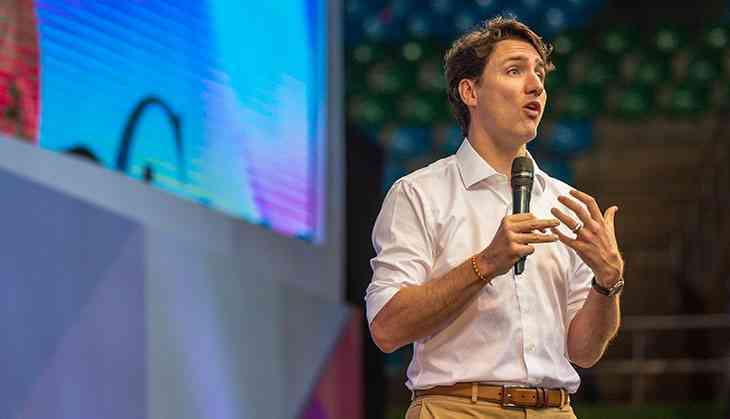 Trudeau addressed the packed Indira Gandhi stadium filled with 5000 people – most of them students, young entrepreneurs, leaders, activists and other professionals. He was welcomed to the stadium with a roar of applause when introduced by his wife Madame Sophie Gregoire Trudeau. Trudeau’s keynote speech at the event titled - UNYCC - Social Impact and Innovation - Agenda 2030 – covered many global issues of education, women's empowerment, economic growth, diversity, environment and technology and the importance of young people to wholeheartedly participate for a better future. He said, “India and Canada are two of the biggest democracies in the world, India in terms of population and Canada in terms of geography. Youth account for 2/3rd of India’s population. The future of the world is here in India. I see opportunity for the youth of India to define yourself not by colour of your skin, your religion, your region, your caste, who you love but by your passion and your commitment to change for the better”. “Developed countries are resistant to change. We are facing climate change, refugee migration and all these new challenges. we need a fresh new way of thinking. Young people can be the source of that change. But you don’t get to be leaders of tomorrow unless you start leading today,” he added. Trudeau and wife Sophie Gregoire Trudeau also emphasised on the need for empowering women in rural India. “We met many women weavers from rural Gujarat who are not only skilled but are helping the local and state economy. When we enable our women to participate in business and politics, we changes our businesses and politics for the better. When women rise,men and boys rise too,” Sophie Gregoire Trudeau said. Other speakers at the conclave include NITI Aayog’s CEO Amitabh Kant, Transgender Activist Laxmi Narayan Tripathi, Canadian Minister Bardish Chagger and Canadian Ice hockey player Hayley Wickenheiser. ASUS ROG Zephyrus (GX501) sets new benchmarks for gaming laptops. But will you pay Rs 3 lakhs for it? READ NEXT >> ASUS ROG Zephyrus (GX501) sets new benchmarks for gaming laptops. But will you pay Rs 3 lakhs for it?